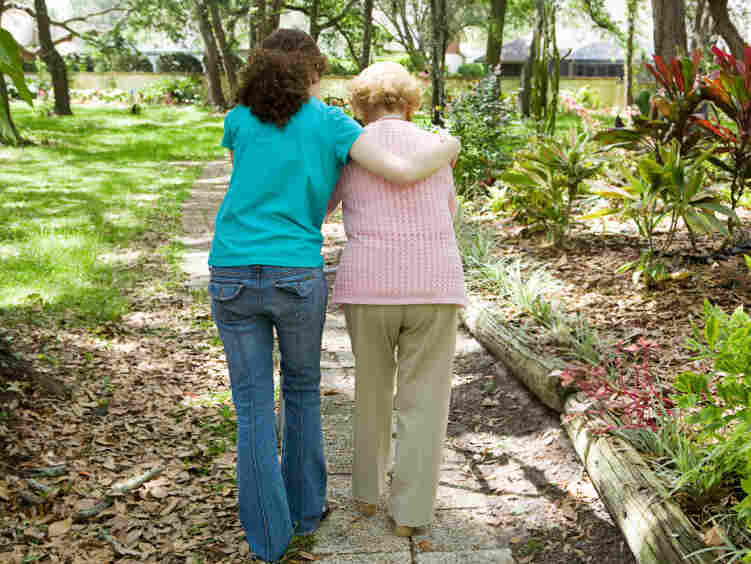 Tiny Strokes May Cause The Shuffling Gait Of Old Age : Shots - Health News The slow, shuffling walk of old age may be caused by invisible problems with tiny blood vessels in the brain. One-third of people who tested normal during life were found to have these tiny abnormalities in blood vessels at autopsy. Stroke so small they're never noticed may add up. Old people who don't have signs of cardiovascular disease still may have suffered microscopic strokes that don't show up on conventional tests. The small strokes may impair their ability to walk, balance and function just the same. The people whose brains had these tiny signs of hardened arteries and stroke were most likely to have had shuffling gait and other movement problems while they were still alive. This means that problems with walking, rigidity, tremors, and other movement issues that are often considered a normal part of aging may not be normal at all. Many old people considered healthy may actually have considerable damage to the tissue and blood vessels in their brains. "There's a limit to what you can see in brain imaging using current technologies," says neurologist Aron Buchman, Rush University Medical Center in Chicago, and lead author of the study. "These are not people who had a diagnosis of Alzheimer's or Parkinson's disease. These are people who had mild motor findings that otherwise would be written off as normal aging." Though that may sound like yet another grim prognosis associated with aging, Buchman says it opens the possibility that what seems like an inevitable result of old age could be treated or prevented. "Loss of mobility, mobility disability, slowing of gait is something that's ubiquitous in older people," Buchman told Shots. But this study didn't show that the brain damage caused the movement problems, because it only compared the state of the people's brains at death with examinations of their health while still alive. "I wish that we had something like carbon-14 dating like they have at archeological sites, so we can figure out when problems arise in the brain," he added. One way to figure that out may be to use conventional brain imaging techniques like MRI over time, then compare the changes over time with the state of the person's brain at death. But that work has yet to be done. Buchman praised the priests and nuns who volunteered for the research, which was part of the Religious Orders Study. "They came in for tests for 15 years, and then they donate their brains at death. They deserve our special thanks." The results were published online in the journal Stroke.